Card Meaning: A man holds tight to his four pentacles in this card. And in this case, the refusal to budge may be damaging. This is the miser card. Remember how the Querent got more work, money, luck, health in the last card, the Three of Pentacles? Well, he’s holding on tight to what he’s got, not sharing it with anyone, not investing it in the future, just holding onto it, trying to keep it still and unchanging. When this card appears it tells the Querent that they’re in a position of status, health, money, even comfort. Solid, and unchanging. But the Querent is too afraid of losing all this. The card reminds them to throw their bread upon the waters. Share the wealth; be generous with good luck and good fortune. A miser lives always in fear, never able to take delight in what they have, or create from it those things worth having like friends, family, a good name. Relax a little, be less worried about loss of what you have – it’s not going anywhere. Focus, instead, on how to make the best of what you’ve got while you’re around to enjoy it. 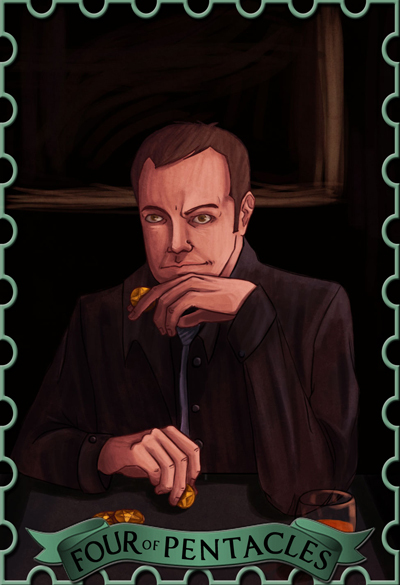 Notes: I chose Crowley mainly because as the crossroad kings, he is never one to give up what he has, especially those souls since they hold so much weight in hell. He’s a stingy guy, purely business and always trying to get ahead and do what’s best for him. But as he’s learned recently, sometimes you need to give up some things in order to survive and that’s that.